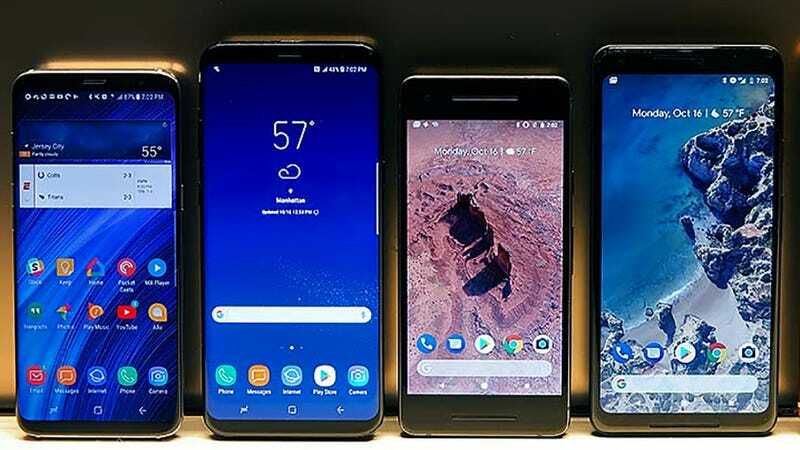 Google and Samsung are locked in a battle at the premium end of the Android smartphone market, and one of the reasons why you might pick a Google Pixel 2 over a Samsung Galaxy Note 8—or vice versa—is the on-board software. We put the two flagship devices side by side to see how Pixel Android compares to Samsung Android. Having a clean, stock version of Android was always one of the main selling points of Google’s Nexus devices, but with the Pixel series, Google is pushing this further—adding more exclusive tweaks and extras on top of the “stock” version that every Android phone maker has access to. Essentially, Pixel Android is the new stock Android. Meanwhile, Samsung’s take on Android, originally called TouchWiz and now called the “Samsung Experience”, has gone from cluttered and complicated to something much more compelling—it’s certainly different to what you get on the Google Pixel. No surprises here. Google Assistant runs rings around Bixby—though to be fair to Samsung, it hasn’t been in the digital assistant game as long as Google has. Thanks to Google’s deep AI expertise, and integration with a host of other apps, Assistant is way ahead at this point. Google Assistant can find nearby restaurants, and launch driving directions, and find pictures on the web, much more intuitively than Bixby can. Where Bixby does have the edge is in giving you more granular control over your phone and some apps—so for example “open Settings and turn on vibration” works on Bixby but not on a Pixel phone. It’s no secret that Samsung loves to pile features and options on top of each other whenever it can, and although its OS and apps are much easier to navigate around than they used to be, they still seem confusing compared with the Android OS on Pixel devices. It’s evident everywhere from the lock screen to the quick settings pane. The opening screen for Settings is another example. Google’s option is simply easier on the eyes (and brain). The search box at the top helps on Pixel Android, as does the way the software hides more advanced options behind a submenu. It’s usually easier to find what it is you’re looking for. Samsung is trying hard with its native, bundled apps—and has made improvements in recent years—but Google still beats it almost every department. Compare Gmail with Samsung’s email app, for example, or Google Photos with Samsung’s Gallery (don’t forget, you get unlimited cloud storage for photos and videos taken on a Pixel phone too). To give Samsung credit, almost all of its apps can now be uninstalled from its phones if you want to stick exclusively to Google’s offerings, so this isn’t a huge issue; but there are still a few, like the Phone and Messages apps, that remain stubbornly in place. To make the best of Google’s superior apps, you’re better with the tight integration that Pixel phones offer. Pixel devices get you to the front of the queue for new versions of Android, just as it did if you got one of the Nexus phones of yesteryear. Samsung isn’t too far behind, but it is behind: Android 8.0 Oreo has been out since August and Samsung just finished beta testing it on the Galaxy S8, with no official roll-out date confirmed as of yet. With a lot of apps and services now spun out of the Android OS itself, this doesn’t matter as much as it used to. Yet it’s still true that if you want the newest features—like dot badges, better notification management, and more—you’re going to get them far quicker if you’ve bought a phone directly from Google. We’ve already mentioned the “Samsung Experience” having a more cluttered interface, but the flip side of that is it’s packed with more options: From hiding the navigation bar, to annotating screenshots, to enhancing the look of videos on screen. If you want to tweak something on a Samsung phone, it’s usually possible. Samsung has managed to make these optional extras more useful and less bloated in recent times, like the “see also” links at the bottom of settings screens in case you haven’t found what you’re looking for, or the extra control you get over the always-on display and the widgets on your lock screen. Now they generally stay out of the way unless needed. Following on from the extra options you get with Samsung phones, you get more customization tools as well. You’re not just limited to changing the wallpaper—you can easily download and install OS themes, complete with revamped icon packs and more, straight from the Settings app. It’s all build in! Samsung loves to try new things, even if they don’t make a lot of sense or work straight away. For example, it offered support for multi-window views on Android long before it came to the official OS. The experiments that Samsung tries can be hit and miss, but it continues to try. Take the App Pair option, currently exclusive to the Galaxy Note 8, which lets you launch two app windows from one icon; or the Samsung Dex desktop environment, which (as this is Samsung) isn’t quite working properly yet, but is something you can’t do with a Pixel phone right now. Samsung likes to stay on the cutting edge, for better or for worse.